Everyone says that when you start marketing online, the first thing you need to focus on, is building your list. The “list” refers to a list of email addresses – people who are interested in what you offer, and are your potential customers. There are many strategies of “list building”, and hundreds of tools. Sometimes, it gets overwhelming to even setup a proper list building system for your site. Today, we review two of the top free tools for building your list and engaging with your visitors. These are Sumo Me and Icegram. While both SumoMe and Icegram are great list builders, their vision is different. SumoMe comes from Noah Kagan and the team at App Sumo. Noah is best known for his killer marketing tactics. We’ve worked with him in the past, and he is super cool. Overall, SumoMe is more focused on traffic generation while Icegram is more about engaging and conversion optimization for incoming traffic. Both SumoMe and Icegram are a collection of tools. There are other plugins that only do one thing from what SumoMe or Icegram do, and charge a heavy fee. 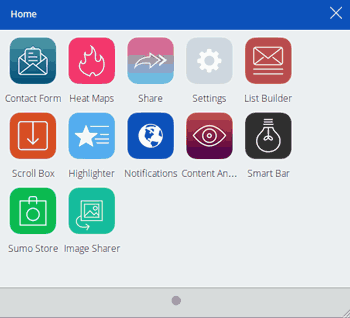 While both SumoMe and Icegram include a variety of tools and are free. The number of tools provided free by SumoMe are more than Icegram, but Icegram has a great number of free themes. SumoMe is useful in specific niche while Icegram is useful in a variety of cases. As a matter of fact, Icegram claims it can be used in infinite situations and even lists 35 possible uses cases on its site. Overall, Icegram may have a higher utility for majority site owners. Continue reading to learn where the “free” party ends and what you have to pay for if you use SumoMe or Icegram. Also the installation, setup, creating your first message, email integration and our final verdict on which is better! Free is fine, but what’s the catch? SumoMe comes with its own branding on each of its messages. Their crown shaped logo is very difficult to dodge and can even distract the site visitor. Once the user clicks on the crown, he is immediately taken to SumoMe’s website. The SumoMe branding (either the crown logo or “Powered by SumoMe”) is always visible to your site visitors. Some users have been put off by this tactic. Some even demanded SumoMe’s removal from WordPress plugin repo. Some have been upset because even after paying a $5/month fee to remove the badge, the “Powered by” link still stays. You’d need to go for the Pro plan ($100/month) to remove all the branding – and get all the features. Icegram removes branding by default! Icegram is probably completely opposite of SumoMe (and most other plugins) when it comes to branding removal. Icegram does not show “Powered by Icegram” or the Icegram logo by default. You need to tick a box in Icegram settings to show a link back to Icegram in your messages. This is awesome because you can now provide credit where it’s due. This branding removal alone can be a big win in favor of Icegram for many people. No Icegram branding will help your visitor focus on your message content and increase conversions. Our take: Icegram clearly takes away the cake here. The crown shaped internal branding in SumoMe messages is very prominent and distracts the visitors from paying attention to the main message. Sad but true, SumoMe branding literally piggybacks on your traffic. Once your traffic clicks the crown you’ve lost the customer from your website as he directly lands onto SumoMe! Pay with your Email Address instead of Dollars? It’s said the good things in life are free. But good things on the internet usually have a catch. They either take your email id to make a list and then send a series of mail of try making you pay somewhere in the funnel. Truth be told, that’s what you may be intending to do using these services too! So building a list by offering a great value isn’t really a bad thing. SumoMe is a hosted service and you need to create an account there to use it. You give your email address to create the account and they send you both useful and promotional emails after joining in. This is not a new tactic, not even a bad one. But you should be aware of it. Icegram too has a mailing list and invites you to join it. But joining it is your choice and completely opted in. You need to create an account on Icegram site to get the free theme pack and analytics add-on though, but again this is optional. So you can use Icegram completely free, without even giving your email address. Both SumoMe and Icegram work on the freemium model. Where the basic service is free and you need to pay to get more advanced features. There are multiple “upsells” for SumoMe. One is to remove the branding as we mentioned above. To get email support, you can pay $5/month. You can review SumoMe’s Pro pricing here. Many people feel SumoMe Pro is pricey. And their upsell tactics can feel like sly tricks. But there are tons of people who pay for SumoMe and are very happy with it. There is no “Pro” version of Icegram. Icegram does not restrict you in any manner in the free version. Most people feel Icegram is giving away too much for nothing. Many have said that the free version of Icegram provides much more than most premium plugins. But Icegram too needs to make money to sustain and grow their business. And Icegram does it by offering premium add-ons that extend and enhance the core functionality of communicating with your visitors. Each add-on is priced from $15 to $49. You can even buy the Super Bundle – a collection of all the premium plugins – at a steep discount i.e $99. Note: The remote add-on and Theme Pack 2 are the only things not included in the Super Bundle. Icegram follows pricing strategy similar to most top WordPress plugins – you take a license based on the number of sites you want to use it on, plus pay for support and upgrades after the first year. Icegram is a hands down winner in pricing department for a number of reasons. Support is included – even for free plugins! If you got the knack of creativity Icegram is a canvas waiting to be painted. It will amaze you with the amount it gives for free. On the other hand if you want absolute simplicity, niche feature set, and don’t mind paying monthly fees, SumoMe could be your pick in list builders. Continue reading for a walkthrough of installing and using both SumoMe and Icegram. You can then see for yourself and decide which one is better for your needs. SumoMe is a hosted service – SaaS. You can either embed an HTML code on your site or use SumoMe’s WordPress plugin to add the code automatically. So you can use SumoMe on any website. Icegram is a WordPress plugin and works on WordPress based sites. If you want to show Icegram campaigns on other sites WordPress or otherwise – you can use the premium Icegram Remote add-on. So if you want to use Icegram on non-WordPress sites, you’d still need to have a WordPress setup that acs as the centralized control panel, and then use Remote add-on to show and target messages on your main sites. Both the plugins are pretty simple to add to any website. And installation can be done in just a couple of minutes. In Icegram you only need to install the plugin and then activate it. Once active, you get a sample campaign to try out, and all four free message types – Popups, Action bars, Toast Notifications and Messengers. Everything can now be managed from within WordPress. For SumoMe, the process involves a couple of extra steps, but is still easy. After downloading and installing the SumoMe WordPress plugin, you need to register and create your account on SumoMe website. Then you add features you want to use one after another – for example List Builder, Contact Form etc. It took me some time to figure out the difference between SumoMe’s nine tools. And how their interface worked. SumoMe offers a few tools to build your list, a contact form, and tools to see how people interact with your content and site. It’s best if you study things a bit before using them. SumoMe offers different tools. Pick what you want. Icegram works on the concept of campaigns and messages. A campaign is a collection of messages. Each message can be of different type – popup, action bar etc. You can put as many messages as you want in a campaign, and define targeting rules on the campaign. When you activate Icegram, it also creates a sample campaign. Play around with that campaign, and you can easily figure out how things work. Our Take: The entire on boarding process of Icegram is fast and easy. You may have to spend an extra few minutes with SumoMe. Assuming you are using the WordPress plugin, SumoMe appears as a crown on the right hand corner of your website. Click on that, login if required, and then click on the tool you want to use. In this case, we want to use the List Builder. Click on that. One can easily cruise through these options and create a list builder. The live editor makes it fairly simple to configure the subscription form and is easy enough to grasp in the first read. The integration with email services is easy too. You may have to put in some time to configure display rules if you want to target the form only on certain pages of your site. Icegram shows up on the main left menu within WordPress admin. So it’s easy to spot. Once in Icegram, go to Campaigns. Add a new campaign. 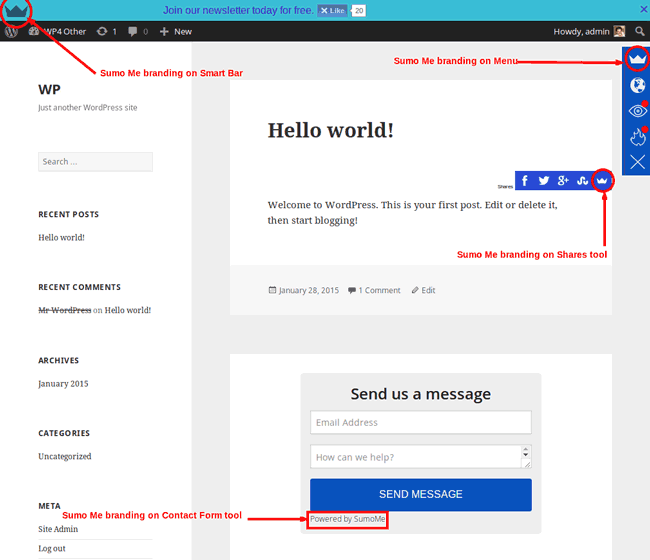 Within each message – you can configure theme, headline, button label, target link (if any), message body (using WordPress editor), Time delay to show this message, it’s position etc. Icegram is similar to filling up a form and then hitting Preview to see how the changes would look. This is good enough because there are many options in Icegram. When you do the preview, you can see all messages you’ve configured in this campaign running live on your target page. 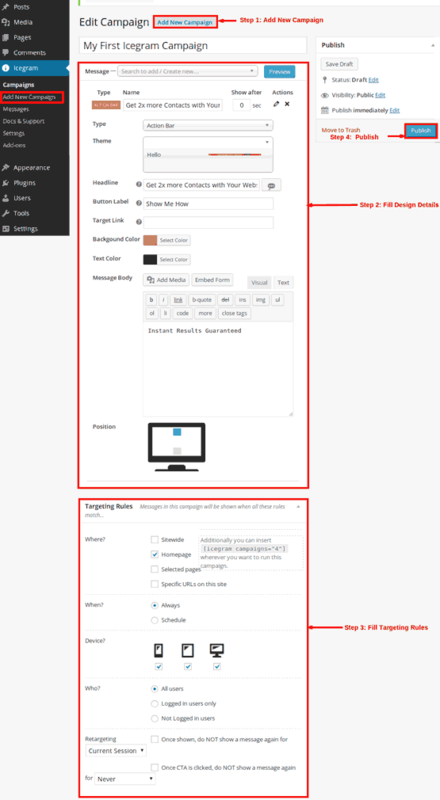 You can add any content to the message body, and a subscription form is treated like one element in message body. So you can put HTML code of your subscription form in message body, or paste it in the “Embed Form” window within Icegram and let Icegram take care of cleaning it up and adding it to your message. 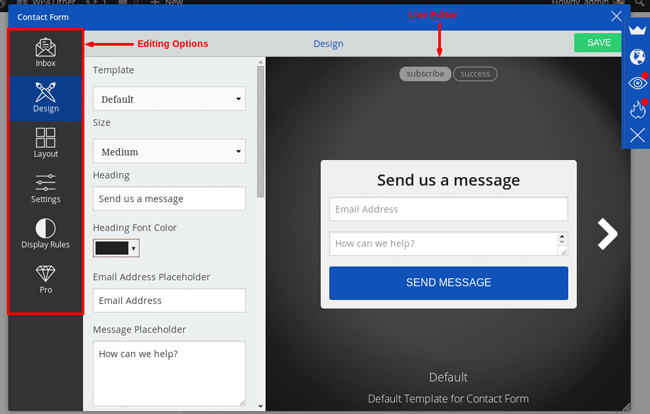 This Embed Form popup is where you can paste HTML code of your form, select a layout (horizontal or vertical), couple of other options and then insert the form to message body. Icegram processes and cleans up form HTML code and adds it to message body. This process is not as simple as SumoMe though. Our take: The live editor in SumoMe is fancy and great for beginners. Icegram is easy too, and works great especially for people who have used the WordPress editor. Both the list builders support all leading email marketing tools. SumoMe has point and click integration for most services. Icegram needs you to paste HTML code of subscription form for the integration. Icegram is a bit more work when it comes to email service integration! With both solutions, you can customize form HTML if you like, but the process can be tad tricky if you are not savvy. The unsaid rule of list builders is that it should appeal to your visitors. A pleasant design will increase trust and get you more subscribers. This makes the design/theme of the list building tool really important. SumoMe comes with one default theme. This theme is good and works well. But if you want to use any of the other themes, you’d need to upgrade to Pro plan or pay $6 for each theme. SumoMe’s list building tools are aimed squarely at just that – list building. You can customize the title, button text and labels easily. This makes it very quick to get started. You can just fill in a form and see your changes. But if you want full design control, that’s not possible. Icegram has ready options to change message title, button text, colors etc. And gives you standard WordPress editor to enter message content. This gives you the freedom and control to add any content – images, videos, text – and format it to your like. Our take: SumoMe offers limited, but easy to use options for entering content and changing design. Icegram allows changing all basic elements easily but also allows full control over content by using the WordPress editor. SumoMe can store details of each signup through your list builder and allows easy review and download. You also get statistics about subscriptions and conversion. 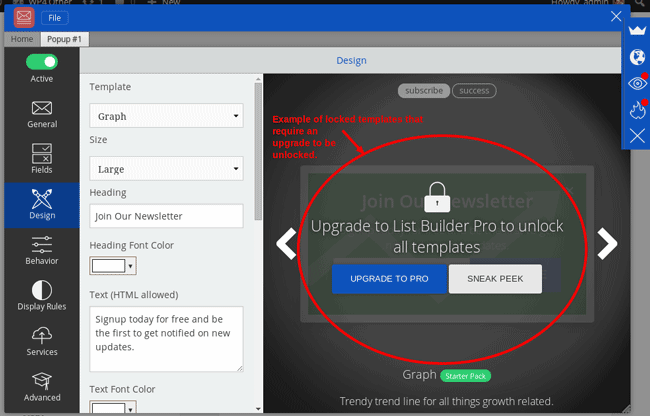 Icegram is more than a list builder and does not store subscription form signups within itself. You’d need to check subscription data on your mailing list service provider. But you can track and see the number of times messages are shown, and how many times they’ve been clicked on – giving you a conversion rate. These stats are available both at campaign and individual message level. Going beyond – Multiple List Builders? SumoMe can have only one list builder at a time. One Smart Bar and one Scroll Box. Basically only one of each tool type. So if you want to show different subscription forms, you’d need to use a different tool for each. And there too, you’d be limited to 3 forms. You can target them to different pages, but you can’t go beyond three subscription forms – even with the Pro version – however relevant or necessary it might be for you. Icegram on the other hand is uber flexible. Right out of the box, you can setup unlimited messages, call to actions and subscription forms. You can target them to the same page, or different sections of your site. For example you can have setup two campaigns – with one popup and one action bar each. Then show first campaign on your homepage and the other on contact us page. You can even reuse messages in different campaigns and create as many campaigns as you like. Our take: Unless you are driving everyone to a single list, one form limitation can be a big deterrent for SumoMe. Icegram’s unlimited everything is a huge advantage and allows testing and targeting campaigns effortlessly. One message may not work for all visitors, and Icegram lets you show different messages to different people based on flexible targeting rules. Thus, Icegram owing to its zero limitations and flexible rules is a clear winner in this department. Apples to Apples? What’s missing from one but found in another? SumoMe and Icegram are not created equal. Not even for the exact same purpose – or target market. While they both do list building, there are a lot of differences. What does SumoMe have that Icegram does not? What does Icegram have that SumoMe does not? Bottomline – Which is better? SumoMe or Icegram? If you want a straight forward list builder go with SumoMe. If you want unlimited everything and full freedom, go with Icegram! If you want content analytics / heat maps / sharing tools, use SumoMe. Or use any other service that provides these (there are plenty). And then use Icegram. If you want advance targeting, customizations and more designs go with Icegram. If you are on a budget, go with Icegram. If you don’t want to show SumoMe branding to all your visitors, go with Icegram. Overall: Icegram is the winner! Have you used Icegram or SumoMe? Both? What’s your experience? Do post a comment! Like seriously, I don’t have to use SUMO you before making a conclusion. Icegram won my heart the day I came across it. Icegram is the angel I knew and sure okay for me than the Angelina I don’t know. At $100 sumome is expensive. You guys have done well to break their momoply. I’ll try you out as soon as I launch. Sure so try Icegram out Kousar. Bet you will find it better than Sumo Me not only with regards to the Price but also its Features & Benefits. I will definitely have a second thought on this one… I have been researching the best, affordable and efficient alternative to SuomMe because I really don’t like the way their brand label shows up everywhere and even more, I don’t like the way the SumoMe app keeps showing up on the website sidebar of my websites. Thanks for this in-depth post comparing your product with SumoMe. Interesting! A very detailed review of both plugins. From the post and description, Icegram is the winner for me. Going to try it out. And thanks for sharing. Thank you for this insightful article. It was very, very helpful. Thank you, again. Here is a video to modify the SumoMe badge. Thank you for the nice explanation here.. Currently I’m using sumome and happy with the results but yeah, their upsell are really expensive. I’m confident that the amount of features and themes that come along with Icegram’s free version won’t disappoint you. Also, if you need any help, feel free to mail us at hello@icegram.com 🙂 We’ll get right back! You guys are simply superb and you’ve done a great job to give an Important plugin to everyone for free.But my doubt is, how many days you’ll stick with your policy by distributing your pugin for free without removing any features? It’s been well over a year since we launched Icegram – and we’ve only added features to the free plugin! Your concern is valid – not just for Icegram – but for any WordPress plugin or theme. Or for that matter any software / service you use – paid or free. We are here to be a strong business and continue serving our customers for very long time! my friend told me about sumome and after going through their website i was still not sure for signing up then i google for sumome alernative and found this awesome post, very well explained and for me icegram is better than sumome, thanks for this post ! Thank you for the appreciation 🙂 I’m glad you like Icegram better than Sumo Me. Keep Icegramming.. I got the mail for attaching the SumoMe plugin to my website and i have added it also. But after reading this article I have changed my mind and I uninstalled SumoMe.. You are right – there is no free lunch in this world! Happy you found the article useful. Feel free to share it in your circle. Thanks! You left out one thing: how to uninstall Sumome! Actually, I began messing with Sumome yesterday, only discovering this morning, after a half day of struggling, it doesn’t work with WordPress.com. Since I only have an Android smartphone at this time, and no money to invest in a self hosted site, I Googled for similar apps and found this article (at the top of the search results page!). I am using the site mentioned for experimentation, but will be using it regularly, especially on one I am presently working on to blog a book. Thank you for such a clear and concise presentation of the two with their similarities and differences. All the best Ken. Hope Icegram proves to be beneficial to you. Do let me know your Icegram experience! Honestly tired of Sumo’s continuous over branding, so am gonna give you guys a shot. Hope it will be worth it? Maybe better pop-up to collect emails, I wish Icegram have its own sharing tool. We don’t need anything fancy, just a light and working one without the evil corporate branding of sumome. Sumome is awesome, but hey Icegram you could too. I’m using currently using ActionBar which without any branding from Icegram. It cost few bucks on HelloBar. Thank you for your kind words Carl 🙂 Do try out our other options too. Sure you will love them as well. What most webmasters hate about SumoMe is the branding. No one would like to be looked down upon. ( With some people branding may mean Free which is not always the case.) That alone may take your reputation away. With the behavior triggers, is the Fee one time? Thank you for views on branding. It resonates with many for sure! Regarding Behavior triggers, it is a yearly license. After a year you need to renew the license for receiving support and new updates. Even if you choose not to renew, you can still use the add-on but minus support and fresh updates. Its seems there are no longer addons the time I wanted to purchase. The Cheapest price is very basic for me and the pro is way too Pricey! As there are only 4 plans, customers now find it easier to make the decision faster. We also tried keeping the pricing suitable for every budget. However the biggest advantage of plans is that you get multiple addons all at once. Thus total value for your money. Finally learnt that nothing comes free, but they have bigger strategy to overtake bloggers with an intention to help them! Brands do tie up some or the other bait under the pretext of being FREE. Sumo Me does it with it’s Internal branding. At Icegram we don’t believe at being dubious and thus the core Icegram( popups, messengers, action bars and notification messages) is completely free without any catch whatsoever.The paid add-ons are completely optionally. That is, the user can choose if he wants them or not. No force in any way. Do try out the core Icegram. hi, thanks alot for the comparison – I’d never heard of Icegram before reading this post. Even though you’re bound to be more in favour of Icegram (as you’re the developers), I found your review very informative. I currently use SumoMe on my website but would like to start offering content upgrades on individual posts, so it looks like Icegram’s multi-use and flexibility is what I need. Thanks! ps, do you integrate with the less well-known email management services, such as Campayn or SendinBlue, or will Icegram work with an intermediary such as Zapier? Does Icegram include social sharing icons? Thanks Andrea, I’ll take a look. Thanks for a very detailed breakdown – I’m a relative newbie and was searching for reviews on Sumo – this has definitely given me something to think about as I don’t have a very big budget! I’m now leaning towards Icegram! Feel free to take Icegram for a spin. We will always be there to offer help if you ever have any queries. Interesting article. You have given it a new dimension. Seems like I need to learn a lot from your blog. are looking around forr thios info, you can help them greatly. Thank you for the appreciation. Glad you liked it! So, what is the best between SumoMe and icegram plugin? What plugin should I try first? We have given all the comparison between SumoMw and Icegram. I will suggest trying Icegram first as you can try it for free. SumoMe All the way for me.